Anteaters: A Neglected Cost to Ant-Plants? The tamandua, an arboreal anteater, pondering the potential meal waiting in a nearby Cecropia tree. The benefits of hosting an ant colony often outweigh the costs for Cecropia trees, which is why the mutualism exists in the first place. Typically, we think of costs in terms of the services the plant provides for the ants; producing food bodies and allowing sap-sucking scale insects to feed. In one extreme example, some species of ants trim the flowers of their plants, reducing fitness in their Cordia hosts. The unsatiable beast barreling through the understory. However, a possible cost that has received less attention is anteater attraction. Hosting a colony invites the risk of a potentially catastrophic anteater attack, especially for younger, developing Cecropia trees. I have gathered a few anecdotal observations over the years where I arrive at a long-monitored Cecropia tree, ready to start a behavioral experiment, and find a dismal scene: the tree ripped apart, the stem snapped in half, internodes exposed, ants scattered, and leaves uneaten. I have yet to catch a culprit red-handed, but it was clear the beast was interested in the ants, not the plant. Furthermore, the incisions that opened the internodes looked like the work of precise claws and not brute force, pointing to the tamandua, an arboreal anteater. Regardless of the perpetrator's identity, the plants clearly suffered a serious blow merely by being between the predator and its prey. A setback like this could be detrimental for a pioneer plant in the fast-paced, competitive environment of a light gap. The scene of the crime - incision points expose the meat of the colony and ignore the foliage. Another downed tree with internode incisions. Cecropia trees might be a particularly susceptible ant-plant because Azteca ants don't have venomous stings like Pseudomyrmex ants in Acacia trees. Though Azteca are fast and bitey and swift to remove insects, they are likely less effective at deterring large vertebrates like anteaters, leaving their tree exposed to a big risk-by-association. Many questions remain - how often does this happen? Can ants and plants recover? Do anteaters target certain sizes or ages of trees? Of course, these ponderings must be tested. Experimental planning is underway. 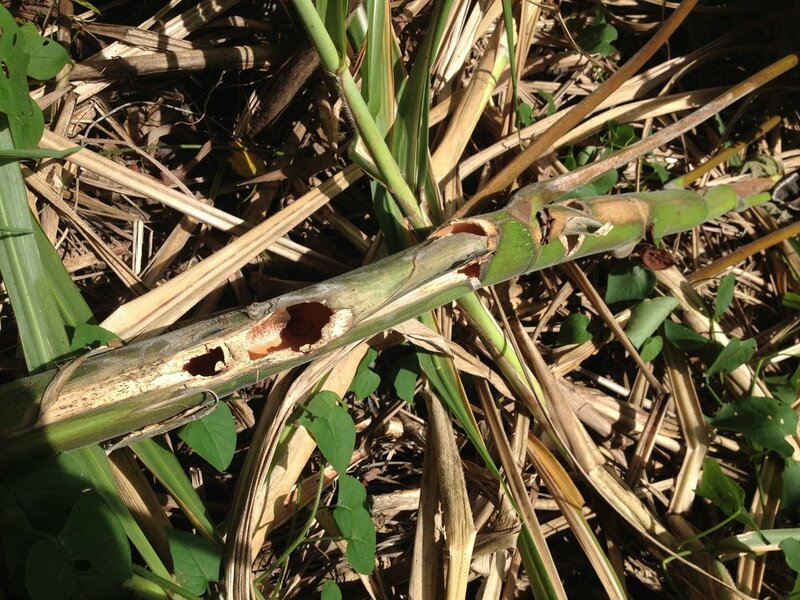 An instance of attack where the stem was not snapped, but there were still incisions in the internodes.